The Fondest of Farewells – Thank You, Lila! A celebration of Lila’s life was held at the Textile Center auditorium on June 25, 2015, a wonderful and warm event made possible by MANY of her friends pitching in. Francie Iverson was a gracious mistress of ceremonies, and the speakers contributed funny and heartfelt reminiscences. Two of the talks, and more information about the other speakers and the event, will appear in the next issue of the Norwegian Textile Letter (soon!). 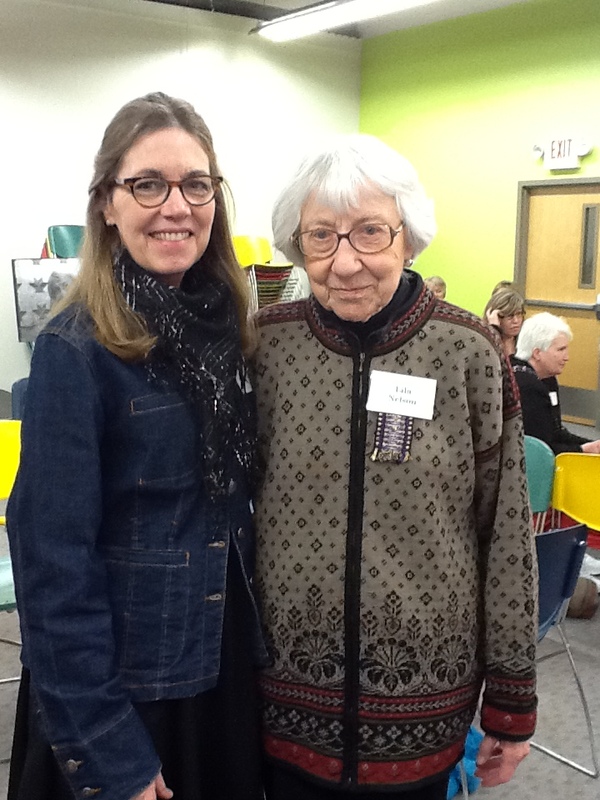 Laurann Gilbertson focused on Lila’s remarkable contributions to Vesterheim and the weaving education program. Wendy Stevens told a tale of barter for Lila’s “Albert the Alligator” tapestry. 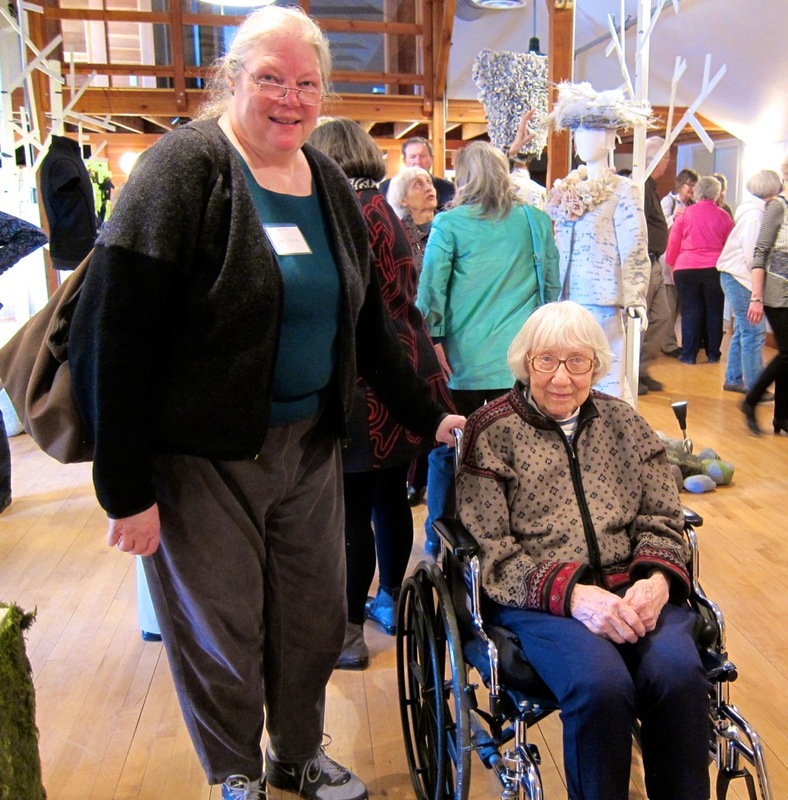 I know I am speaking for many of my friends, and all the current and past members of the Scandinavian Weavers Interest group when I mourn the loss of our fabulous friend and mentor, Lila Nelson. Lila’s reputation preceded my friendship with her. 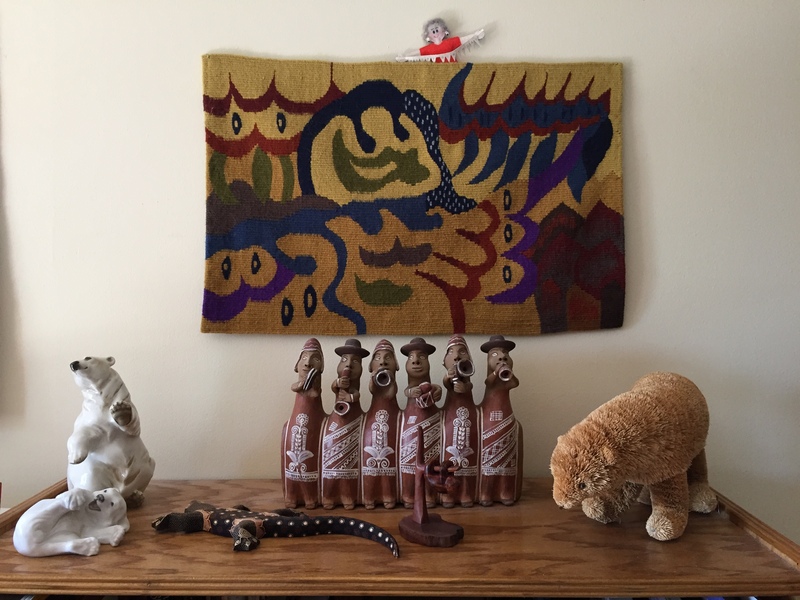 When I was in college I saw her weaving displayed somewhere, and it included a cushion-sized tapestry piece in a traditional Norwegian weaving pattern called skybragd. I had read about that pattern, and the fact that it was so difficult to do well, as if no modern-day mortal could weave it. Lila did, and I was in awe. At the time I never imagined that I would come to know Lila so well. Her weaving was a source of great joy in her life. If anyone here saw the enormous number of rolled-up tapestries stored in the couch in her living room, you would know what I mean. During all the years she attended the Scandinavian Weavers Study Group meetings, everyone in our group was constantly amazed at the new work she consistently produced. Lila helped us with our work, too. She always found something important to say in response to pieces that were displayed at our monthly “show and tell” sessions. Her remarks were important in that they were always kind, and delivered in a way that was supportive. You could show a sample or a first-time attempt and Lila would find the good and important in that effort: that the color choice was good, or how a different choice of warp would change the stiffness of the piece or enable you to cover the warp better. The point is that she had deep knowledge of techniques, a discerning and experienced eye, and a true desire to help her friends improve and be inspired to continue. She never stopped learning and experimenting. One year she told me about her intention to learn more about the language of abstraction, which to my mind, she already used to great advantage. Another time she was enthusiastic about switching to red warp in her tapestries. 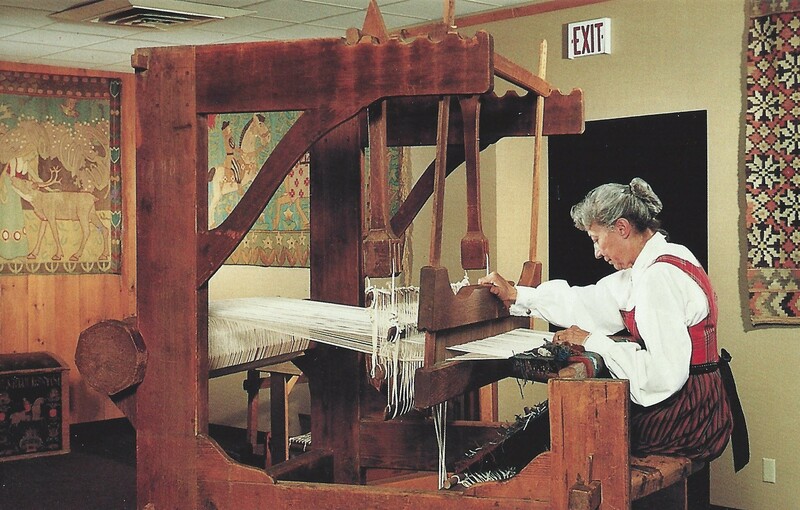 It didn’t make a difference in the completed pieces, because the warp was covered, but the red she saw during long hours at the loom made HER happy. In addition to Lila as a weaving mentor, she showed me how to live a gracious and sensible life in so many ways. She was a supportive and loving wife to her husband. She didn’t feel the need to collect things, but didn’t mind that their house contained boxes and boxes of Marion’s crazy crocheted hot pad holders, for example. I keep that in mind as my husband keeps buying new and old vinyl records. She kept making surprising decisions, which in retrospect made so much sense. Many years ago she announced at our Scandinavian Weavers meeting that she was just going to concentrate on her tapestry weaving and was no longer going to participate in our monthly meetings. I think we all sat at the table, stunned. How could we possibly continue without her? But it was OK; our group has thrived. Each Christmas, including this past Christmas, we continued the tradition of celebrating in December with Lila. The past few years the gathering has been held in the party room at Lyngblomsten. A photo from a pre-Lyngblomsten year. 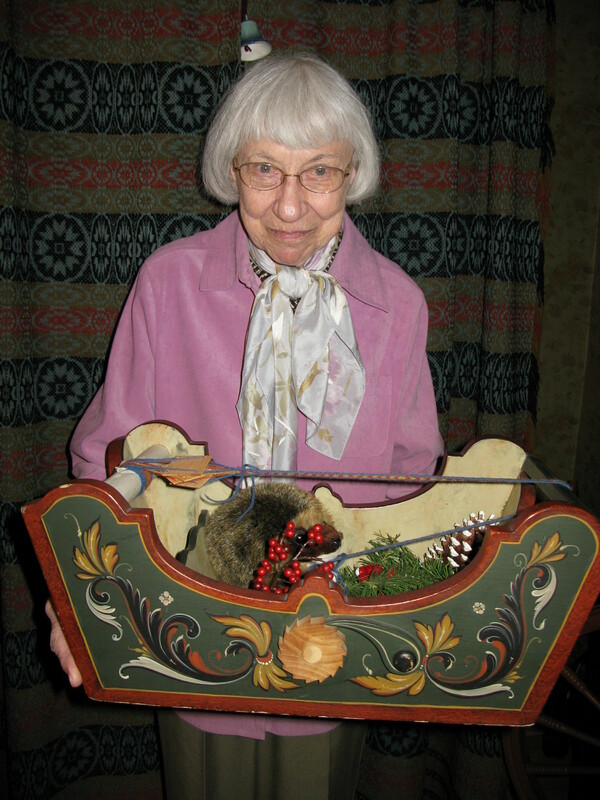 Lila had so many wonderful objects in her home, particularly during the holidays, like the best-possible museum you could visit. One year she announced she was going to sell her car; it was time to stop driving. Later she said she was going to move to the assisted living facility at Lyngblomsten – that was her own, sensible decision. And not only that, she was going to stop weaving and sell her loom. I felt bereft that she would no longer be weaving, but she looked forward to another chapter, a time to read and write. When I visited Lila at Lyngblomsten, she was always gracious and so pleased that I came, even when I felt she could have chastised me for not coming more often. She had a way of making you feel that she has been doing well, but now that you are here, everything is great. 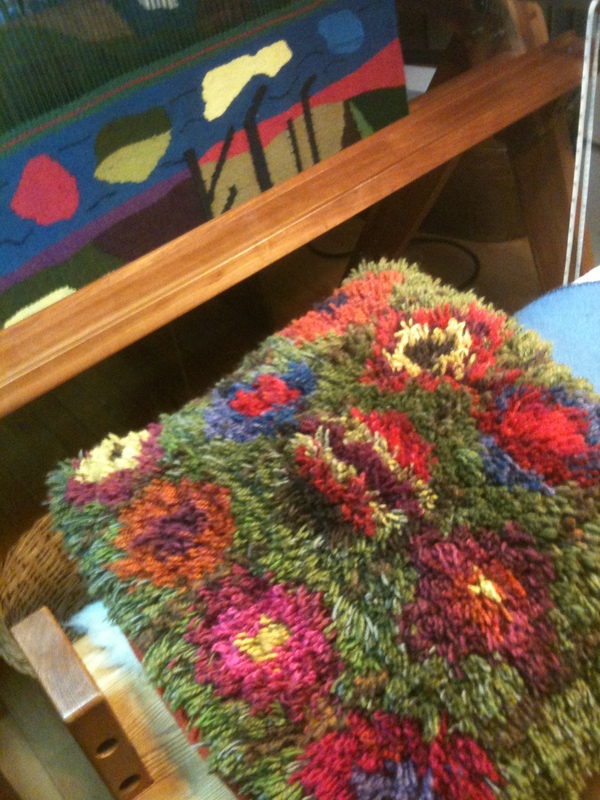 She always asked about the Weavers Guild and the Textile Center. Is there anything new at the Guild? Always a gracious hostess, she would ask if I would like a glass of wine. Since it was usually about 2 pm when I visited, there weren’t many occasions in the last years to share wine with Lila. However, we did both drink a little wine at the festive book launch here at the Weavers Guild in May, Lila’s last outing. When I finished a new piece of weaving, I loved to take it to Lila for appreciation. I’ll miss that. I’ll miss Lila. And tonight I’ll drink a little red wine in her honor. Skål to Lila. Addendum: Lila loved travel and life experiences, and wove them into her work. 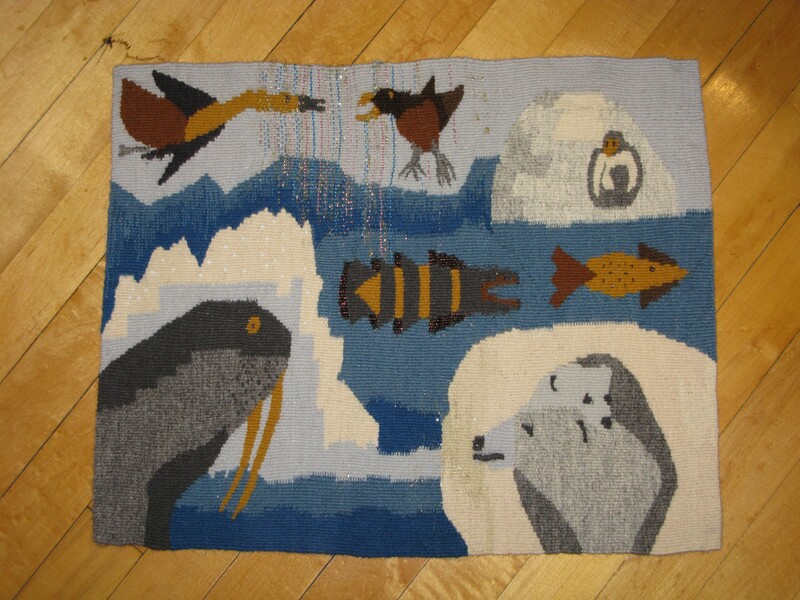 After she visited the polar bears at Churchill, Manitoba, several wonderful tapestries resulted. What a lovely tribute Robbie. Concordia College in Moorhead has an amazing Danskbragd that Lila wove in the art collection, I marvel at it each time I see it.